We’d love your help. Let us know what’s wrong with this preview of Saving the Mail Order Bride by Linda Broday. To ask other readers questions about Saving the Mail Order Bride, please sign up. "You're not alone, Jack. You have me. I'll stand by your side through sunny days and storms." I just can't get enough of Linda Broday's books. I have been reading less and less historical romances (HR) lately, but I can never turn down any of Linda's books. Her books are set in the Wild West, which is my favorite type of historical romance subgenre. Her books are original, engaging, suspenseful, romantic, emotional and fun. It's the whole package I crave from HR, and Linda keeps on delivering. Saving the Mail Order Bride is my favorite so far. The characters were well rounded, intriguing, and very lovable. This doesn't mean they were perfect, however everything they did, they did for a good reason. Jack is a lawman turned outlaw, who is wanted and knows one day he will be hanged for his crimes. Nora Kane is his mail order bride, who hasn't had an easy life. "Even if he spent the rest of his life in her arms, he'd never get his fill of Nora Kane. She set his world straight and gave it color. No longer was everything in black, white, and dull gray." A meet-cute for the ages occurs when mail order bride, Nora, rides a stage coach sitting opposite a manacled felon only to learn that he's the man she's come west to marry. The author's tough and authentic western storytelling, engaging characters and their heartwarming romances really shines in this second of the Outlaw Mail Order Brides series. Saving the Mail Order Bride is the second book that tells the story of another Hope's Crossing reformed outlaw, Jack Bowdrie. It can be read standalone, A meet-cute for the ages occurs when mail order bride, Nora, rides a stage coach sitting opposite a manacled felon only to learn that he's the man she's come west to marry. The author's tough and authentic western storytelling, engaging characters and their heartwarming romances really shines in this second of the Outlaw Mail Order Brides series. Saving the Mail Order Bride is the second book that tells the story of another Hope's Crossing reformed outlaw, Jack Bowdrie. It can be read standalone, but works ever so much better read after the first when the Hope's Crossing world is established and several of the characters, including Jack, are introduced. In Saving the Mail Order Bride, Jack finds himself suddenly taken captive right about the time he is anticipating his own mail order bride. He struck out with the first one at no fault to either, but then he started writing for another lady to come and have a fresh start with him. His suspicions are aroused over the timing of the Marshal arriving at the right spot and the right time, but doesn't have long to ponder that because he no sooner realizes that the cool eastern woman sitting opposite him in the stage coach is Nora his would be bride and then the stage is in a dreadful accident leaving them to make their way together. Nora wants to be upset at Jack for neglecting to mention in his letters that he was a wanted outlaw, but then again, she's got a few deadly secrets of her own and has danger dogging her all the way to Texas. If Jack doesn't killer for annoying him and causing trouble, she's pretty sure the trouble in her past will. Meanwhile, she might just be falling in love with this surprising husband and the little family they gather along the way. I went into this one with no doubt in the world that I would love it. Jack was a character in the previous book that I wanted so much for him to get his happily ever after, too. His past broke my heart and Nora is just the sassy, stubborn, and courageous gal to be his match. She had a rough start for her first time out west, but she was plucky and owned that she was in over her head. This pair were so wonderful together. And, the kids, oh how I love that the romances this author writes frequently center around these brought together families. I thought I loved the first book, but I have fickly transferred my top affections for Jack and Nora. All the excitement and twists I loved in the first book were matched in this one. I saw some coming, but others took me by surprise. I love the rise of action and situations that are unique to this western setting and time period. The author writes this well blended with her romances and people who fit the backdrop. All in all, I thought this was absolutely fabulous and am greedy for more outlaws at Hope's Crossing to get their romances. Western Historical Romance fans need look no further for an engaging series to love on. I like this series, yes sometimes I shake my head and then remember that this is from a different era, I didn't start with the first book but it didn't change my enjoyment of it. I actually started with the book previous to this one, the one with Tally and Clay and was one over with that one, so I really recommend you to get them it will just further enhance your liking of it. This book was Jack and he had a pretty tragic past which made you understand what he went thru, I am really happy that h I like this series, yes sometimes I shake my head and then remember that this is from a different era, I didn't start with the first book but it didn't change my enjoyment of it. I actually started with the book previous to this one, the one with Tally and Clay and was one over with that one, so I really recommend you to get them it will just further enhance your liking of it. This book was Jack and he had a pretty tragic past which made you understand what he went thru, I am really happy that he got to meet Nora and she was definitely the one for him. Nora was a little stuck up at first but it wasn't really that she was just terrified and when you hear everything that she went thru you felt for her and wanted her to also get a happy ending. These two struggled to get to someplace safe not only for them but for the two children that they saved on the way. We get to reconnect with the other characters and I love knowing what they went thru, and I can't wait for Ridge's story and hopefully Rebel to get the happy ending that she has been waiting for..enjoy! From the moment Jack winked at Nora in the stagecoach, I fell in love and never looked back! I was intrigued by the glimpse of Jack's story that we caught in the previous book, and knew I needed him to find himself attached to his happy ever after soon. And haha, boy did he! Literally. I simply adored how Jack and Nora met, how their spark lit up their connection, how quickly and naturally they grew to care and depend on the other -- and then ultimately need and fully desire the other. How they c From the moment Jack winked at Nora in the stagecoach, I fell in love and never looked back! I simply adored how Jack and Nora met, how their spark lit up their connection, how quickly and naturally they grew to care and depend on the other -- and then ultimately need and fully desire the other. How they communicated, and how they refused to let anything come between them from moment one. And truly, how it was them taking on the world together from the beginning. Jack claimed my reader's heart with his presence - he was rough, tough, strong, bossy, stubborn - but buried under that was a honor and respect and devotion that perfectly balanced him out. He had such a deep sense of loyalty to his brothers-in-arms and to his family he was building. And then add in the swoony charm he threw in pursuing his Nora? Oh yeah, I was a gonner. Nora, oh my goodness! This woman was perfection for Jack. She had guts, sass, determination, bravery, and such a huge amazing heart of gold. She didn't allow her past to destroy her, she figured out what she wanted and needed and went after it with a passion. And despite the struggles, she remained soft and sweet. I truly adored them separately, and then together as a couple. The adventure and dangers kept the pages turning - delivering quite a few surprises and heart-pounding moments. And generously balanced in was some moments of peace and beauty. Toss in some beloved secondary characters and main characters from past stories (Hello, Sam Legend - I'm looking at you, sir!) and I couldn't get enough. I loved this book, it has more twists and turns then you might want. Just when I thought I had things figured out, a new twist in the story happened. I was excited to visit with old friends, and meet some new friends. Loved visiting Hope's Crossing, and seeing the town grow. I was left wanting more of the outlaws and town. ARC copy. A great Western romance. A lot of fun and humor mixed with romance and western adventure. Broday gives her readers interesting characters with her outlaw town series. Remember not everyone is perfect, but everyone dreams of finding their soul mate. There is nothing better than opening up your favorite authors’s book and knowing your about to be swept away into an amazing journey!! Ms. Linda Broday has done it again. Just when I think she couldn’t outdo herself from her last book, she goes and sets the bar even higher with Saving The Mail Order Bride. Jack Bowdre and Nora Kane’s love story is a fast and wild ride to the alter. Both are running from their past, both bring baggage to their marriage, but they’re true to their vow’s and never back down from their enemies. They both have a heart overflowing with love and aren’t afraid of giving it to two orphaned children in need of a home. This book truly melted my heart. I laughed so hard at the antics and situations they are thrust into and the uplifting humor they continue to display toward each other. As I’ve said before, Ms. Broday’s books are timeless and will weave themselves into your heart and soul for eternity. “She met his gray eyes, the color resembling a dove’s wing in the light. “Always as long as it’s with you.” Then she touched her lips to his ever so softly. It's too bad Nora doesn't know Jack is her groom-to-be. All she sees is a scoundrel. But when their stagecoach crashes, they're suddenly left to fend for themselves—and each other. The longer they're together, the stronger their feelings grow. Hounded by desperate men bent on doing them harm, Nora and Jack will do whatever it takes to find their happily ever after...but first, they'll have to shake the devils from their trail. The story of Outlaw Jack Bowdre and Mail Order Bride Lenora/Nora Kane is filled with new experiences for both characters. What are the odds that two people who are pledged to each other end up on the same stagecoach at the same time? One as a prisoner and one as an innocent passenger on the way to meet her intended. Thrown together under extreme circumstances both Jack and Nora find that despite their earlier lack of mutual admiration feelings that are out of their control soon manage to overcome Nora’s better judgement and Jack’s cautionary tendency to remain aloof. First meeting was not exactly one inspiring confidence in Jack from Nora but that soon changed growing for them both into an undeniable bond that neither expected. This couple take the long way to becoming partners in life but it does not stop them from finally succumbing to what turns out to be a life changing relationship for them both. Jack finds a second chance at love and Nora finds the man of her dreams wrapped up in the unexpected package of a man at odds with the law. Now if only that law allows them to live happily ever after all would be as it should! Another great book by Linda Broday and I thoroughly enjoyed getting to see what was happening in the town of Devil's Crossing, now known as Hope's Crossing, and catching up with characters from the first book in this series. Hope's Crossing is a town started by a group of outlaws that no longer want to be out on the run. They just want what most people want, a place to call home, friends and if at all possible to start a family. Linda Broday knows how to draw in a reader in the first pages of her Another great book by Linda Broday and I thoroughly enjoyed getting to see what was happening in the town of Devil's Crossing, now known as Hope's Crossing, and catching up with characters from the first book in this series. Hope's Crossing is a town started by a group of outlaws that no longer want to be out on the run. They just want what most people want, a place to call home, friends and if at all possible to start a family. Linda Broday knows how to draw in a reader in the first pages of her books and keep you wanting to know what's going to happen next. It takes a strong woman to love and stay with a wanted outlaw and Jack Bowdre finds himself in handcuffs sitting next to a U.S. marshall, in a stage coach, before his Mail-order-bride even arrives. This story begins with a crash, the crash of the stagecoach, and Jack finds himself with another chance at freedom when the marshall doesn't survive. This book has a lot of humor mixed in with its adventures, gun battles and the struggles in the lives of these wanted men and other town members. How can there not be humor when Jack, an outlaw ends up handcuffed to an Eastern woman all dressed up in her finery that includes a hat with feathers and a birds nest. This is the wild west and Texas after all. All they have is the clothes on their backs, chained together mere inches apart, on the run, and it won't take long for it to be known the stagecoach crashed and a felon is on the loose. A posse will be on their heels soon and it appears that a man is also after the woman handcuffed to him. That woman is Leonora Kane, Nora Kane, the woman that is Jack's intended bride. Can they really build a life together when he's a wanted man and someone wants her dead? A fun take on the mail order bride. This bride is for an outlaw and their meeting is not at the best time. Of course the outlaw is not that bad and the bride has secrets of her own. Add in a young boy and a baby and you have a great story. Seems the bride can love and save the outlaw. Part of a series with more mail order brides to come. Saving the mail order bride is pretty interesting. It’s the first in the series for me and I was really impressed. Some great men make bad choices and become outlaws. Well for Hopes Croasing these men are trying to change their ways but will protect their own. Jack wants a chance at life again and writes for a bride, but of course life gets in the way and just as his bride is coming he is on his way to jail. Nora is a strong character and very entertaining. She is from the east coast and has no Saving the mail order bride is pretty interesting. It’s the first in the series for me and I was really impressed. Some great men make bad choices and become outlaws. Well for Hopes Croasing these men are trying to change their ways but will protect their own. Jack wants a chance at life again and writes for a bride, but of course life gets in the way and just as his bride is coming he is on his way to jail. I really enjoyed Jack and Nora's story! They were both trying to get away from their pasts and were able to help each other do so. I did really enjoy watching these two interact with one another, they were prefect for each other. This was a great addition to the Outlaw Mail Order Bride series! I received a free copy of Saving the Mail Order Bride in exchange for an honest review. This book nailed it. The author, Linda Broday, had a great plot, lovable characters, and provided several hours of great reading. Jack is exactly the type of man you'd want to get to know. Nora was also very strong character that complimented Jack. Another stellar novel in the outlaw bride series! I loved the humor and adventure that the characters went through. I enjoyed each misadventure they went on together and how they ended up together. I can’t wait to read the next book In the series! This series sure has been fun to read. Saving the Mail Order Bride, has a few slow places early. Other than that I enjoy seeing how these men and women turn their lives around and build a great town. Whenever I open a Linda Broday book I know I am in for one hell of Great Western Historical and of course she never disappoints. Nora and Jack’s story was absolutely phenomenal. I loved every deep ravine gun blazing twist of this book. I love getting to watch Nora and Jack persevere even in the mist of all that could and did go against them. 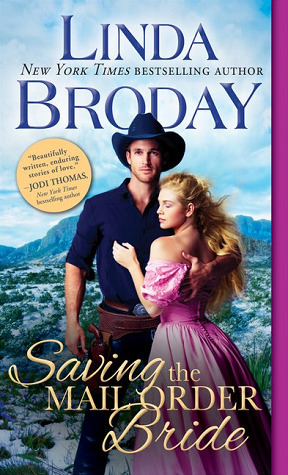 Saving the Mail Order Bride is definitely one of Linda Broday’s finest yet!!!! I received an advanced copy through Netgalley in return for an honest review.